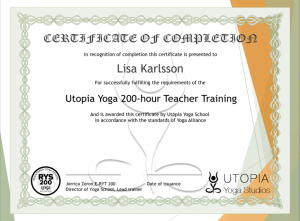 If you’re interested in furthering your yoga knowledge, becoming a teacher, or expanding your teacher education, welcome to Utopia Yoga Academy. 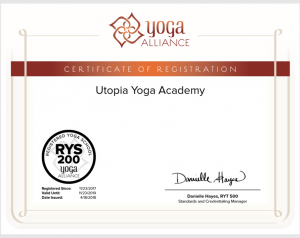 Utopia Yoga Academy is a Registered Yoga School (RYS) with Yoga Alliance, which designates this teacher training program as one which follows Yoga Alliance’s standards. 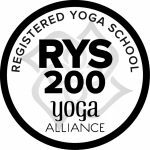 yogaalliance.org Students who complete a verified training with this school may be eligible to register with Yoga Alliance as Registered Yoga Teachers (RYTs). A chance to explore different kinds of yoga, with a specific goal to find your own style and passion. Receive an expansive range of yoga knowledge from experienced teachers around the world. 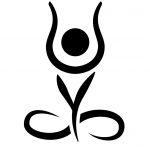 Qualifications in Hatha Yoga, Vinyasa Yoga, Yin Yoga, and Hot Yoga. Anatomy lessons from professional physiotherapists who have years of experience in yoga. Opportunity to teach your practical hours at the studio in classes of your choice encouraging you to create and live the vision of who you are as a yoga teacher. Mentoring from Utopia teachers and staff, helping you grow and love what you do. See our teacher training program attached below for more information on what yoga styles we will explore during this course. Included in price is an unlimited membership at Utopia Yoga Studios from course start date until the date of graduation. Choice of payment: 35 000 sek at once or pay in installments 7 000 sek monthly for 5 months, or 5 000 sek per month for 7 months.